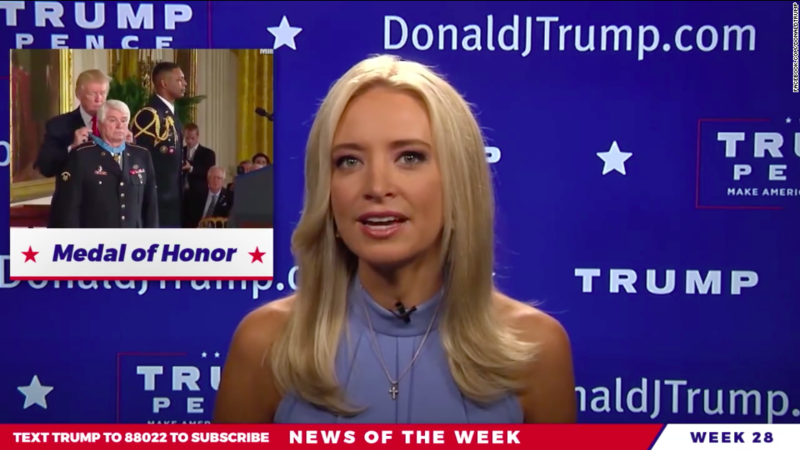 Kayleigh McEnany, the former CNN commentator who over the weekend appeared in a video trumpeting President Trump's accomplishments, has been named as the new spokesperson for the Republican National Committee. "Kayleigh will be an integral part of our Party's ongoing commitment to promoting the Republican message to Americans across the country," RNC Chairwoman Ronna McDaniel said in a statement announcing McEnany's appointment. "Her wealth of experience will be invaluable to the RNC as we continue to support President Trump and build on our majorities in Congress as we head into 2018." McEnany had announced via Twitter on Saturday that she was leaving CNN, ending her role as one of the pro-Trump pundits the network calls upon to provide commentary. In the tweet, McEnany said she was departing for a "new role," telling her fans to "stay tuned" for more details. Then on Sunday she appeared in a video posted on Trump's Facebook page. The minute-and-a-half long video featured McEnany, reporting from Trump Tower in New York City, rattling off a series of positive news stories and crediting the administration with the achievements. More than a few critics compared it to the propaganda disseminated by state-run media outlets; McEnany called it "the real news." McEnany asked to be let out of her contract at CNN in order to go to the new job at the RNC. According to Politico, she is "expected to be a major presence on television for the GOP."